Despite fears that the depressed oil prices hit remittances to India, the country remained the top recipient of global remittances in 2017. World Bank data shows that Indians remitted $69 billion back to their home country, higher than China’s $67 billion. Philippines ($33 billion), Mexico ($31 billion) and Nigeria ($22 billion) were the other top recipients. As the chart shows, remittances began surging after 1991. Clearly, liberalisation was good for remittances well. In spite of low oil prices and declining economic growth, global remittances are expected to grow 4.6 percent to $642 billion in 2018. The pick-up in growth of remittances in 2017 and an expectation of further growth in 2018 is good news for India. But there is cause for anxiety as well. 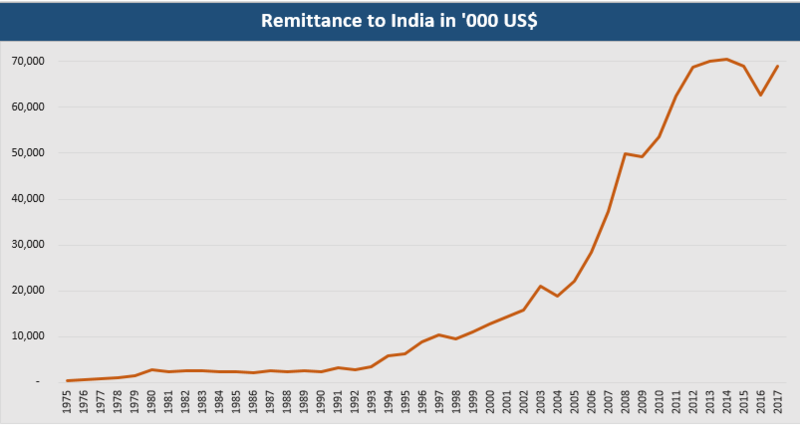 Indian remittances have still not reached the peak of $70.3 billion seen in 2015. As oil prices soften, there are fears that job creation in the Middle East will decline, and India could lose some workers there. Today, as much as 82 percent of India’s remittances come from seven countries - UAE, the US, Saudi Arabia, Qatar, Kuwait, the UK, and Oman. Notably, India also accounted for the largest number of international migrants – 16.4 million, compared to Mexico (11.9 million), Russia (11 million), and China (10.1). A rough calculation shows that the average earning per Indian is among the lowest compared to the top five recipients of remittances. That in effect meant that some of the lowest skilled workers were also Indians. If jobs in the Middle East decline, India will then have to find employment for the people returning from overseas, in addition to finding jobs for resident Indians. And it could witness a fall in remittances as well. Clearly, India’s economy strategists have to identify new markets for Indian labour. After all, irrespective of whether the overseas worker is an accountant, a lawyer, a plumber or a truck driver, he is still Indian labour. India’s biggest exportable surplus is labour. Manpower exports should be a key priority for the government. That would give Indian three advantages: It would earn more foreign exchange; expand the influence of the Indian diaspora; create job opportunities overseas. India should also create large numbers of workers with verifiable skills. That will allow Indian entrepreneurs to export projects along with qualified labour. But Indian skills are uneven in terms of quality. Moreover, the Indian worker is also not as disciplined as his Chinese or the Filipino counterpart. Hence, project exporters first bag a project and then go around looking for skills. It should be done the other way around. India should also remember that if Indian workers become expensive or remain unskilled, Bangladesh is always around. The reason India should worry about Bangladeshis is evident from Chart 2. Bangladesh has among the highest density of population in the world. That incentivises Bangladeshis to migrate to other countries like India, Nepal, Myanmar, or even the Middle East. India has to learn to create skilled workers in large numbers so that they remain cost-effective in global labour markets. India should also try developing project and labour export markets in war-ravaged regions like Libya, Iraq, and Syria in a much more concerted way than it has till now. Fortunately, the last four years have seen Indian foreign missions learning to be more responsive to Indian needs and export opportunities than ever before (thanks to the commendable efforts of Sushma Swaraj as India’s external affairs minister). But a lot more needs to be done. Finally, India should look at developing project and labour export opportunities in Russia. This is because even though Russia has one of the largest territories in the world, it has very few people. Russia is unlikely to import labour from China for fear of the Chinese becoming squatters on Russian soil. Russia is wary about the spread of workers from Islamic nations too. That leaves an opportunity for India. It has already been consolidating its position with Russia in the oil sector (for example, through OVL, the ONGC subsidiary). Russia has been talking to Tata Power about developing coal mines in Eastern Russia, and even building a railway line and port there. Indian should try to get more such projects in Russia. 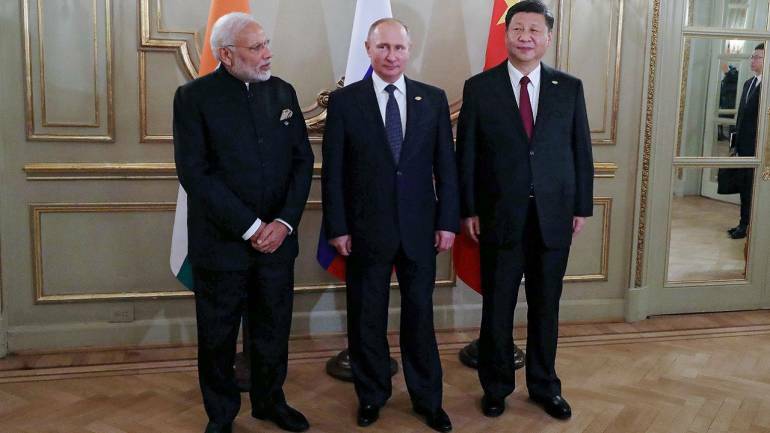 If India handles the Russian front well, both countries stand to benefit because the future of Asia might depend on Russia, China and India working together. The meeting that happened between the three heads of states in Buenos Aires could thus be a significant move. The author is consulting editor with Moneycontrol.com.